It’s that time of year again… We’ve started planning for this year’s big multiphysics simulation event and I am excited to share some of the details with you. 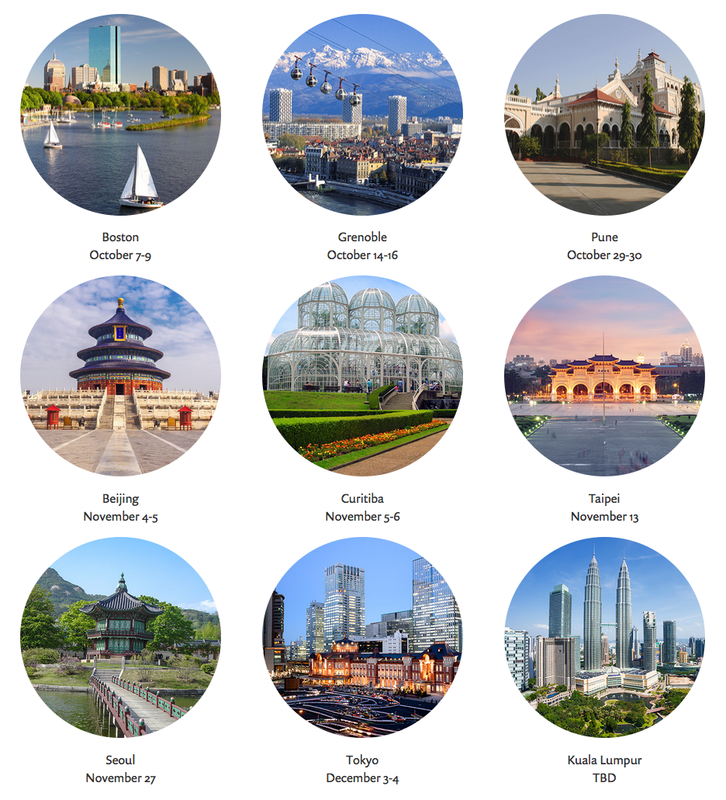 The COMSOL Conference 2015 tour will be making nine stops around the world — and this is your invitation to join us along the way. In October, the COMSOL Conference 2015 will kick off in Boston. One week later, the European simulation community will gather in Grenoble, France. The third stop on the worldwide tour is India, as usual, but this year, we are hosting the event in a new city: Pune. In November, the tour continues to Beijing, Curitiba, Taipei, and Seoul. We’ll be in Tokyo at the beginning of December. We will also be making a stop in Kuala Lumpur but we have yet to decide on the event dates for that location. Stay tuned. No matter which city you join us in, you will be met with training opportunities, industry talks, live demonstrations, and networking events. You will also learn about the future of multiphysics analysis and simulation app design. Whether you are a new user of COMSOL Multiphysics software or a seasoned pro, we’ve got you covered this year by offering new presentation and minicourse topics. We’re also unveiling a new and improved structure to the training sessions. What’s New with the COMSOL Conference in 2015? This year at the COMSOL Conference, we will have both lecture-style and hands-on minicourses. During the lecture-style minicourses, attendees can listen in on application engineers as they show different features and build models using different COMSOL products. Following the lecture, you will have the opportunity to also attend a hands-on session covering the same topic. During the hands-on training, you will set up and solve a few different models. For example, let’s say in the morning you attended a Heat Transfer lecture. In the afternoon, you can attend the Heat Transfer hands-on minicourse, where you will go through step-by-step instructions on how to set up certain models. Note: Applications Team Leader, Walter Frei, will soon blog about all of the minicourses in more detail. Application-specific demo stations are another addition to the COMSOL Conference 2015. While many of you may remember that we have had demo stations in the past, this year will be a bit different. We have invited COMSOL product managers to oversee the demo station of their respective specialty. This way, for example, if you are an engineer who is working on a problem involving nonlinear magnetostrictive actuators and sensors, you can go directly the Structural Mechanics Demo Station. There, the corresponding product manager and application engineers in that field will be able to show you some key features that might help solve your problems more quickly and accurately. We will have application-specific demo stations in a wide variety of fields including acoustics, heat transfer, and more. At select COMSOL Conference locations, we will also hold invited talks and panel discussions led by COMSOL product managers during certain user presentation sessions. Presenters are hand-selected and invited to lead these talks. So, if you are interested in learning more about what fellow engineers are doing in regards to a specific topic: Sit in, listen, and share. Stay tuned for the full COMSOL Conference Program, which will include topics and speaker information. The COMSOL Conference 2015 registration page is now open. If you have work you would like to share with the engineering community, we invite you to submit an abstract as well. After submission, all abstracts are reviewed by one of our many program committee members, who are experts from industry, national laboratories, and academia. Our redesigned Call for Papers website will guide you in the direction that is right for you, whether it be an oral presentation, poster presentation, or both. Screenshot of the Call for Papers webpage. We encourage attendees and presenters alike to register for the COMSOL Conference early. Early registrants can take advantage of discounts and be the first to sign up for training opportunities, both lecture and hands-on minicourses. Register today. From all of us here at COMSOL: We look forward to sharing a memorable and innovative experience with you at this year’s multiphysics simulation event. Interact with us on Twitter via the hashtag #COMSOLconf15 and/or by tagging our handle@COMSOL_Inc.